When another plugin/theme is installed which also has a copy of PHP-CSS-Parser, if its Composer autoloader wins then the required methods and functionality of our fork will not be available. In this case, all of the CSS processing will not be available, including tree shaking. Additionally, feature detection is now done with fallbacks to the methods that are available. !!!WARNING!!! AMP CSS processing is limited because a conflicting version of PHP-CSS-Parser has been loaded by another plugin/theme. Tree shaking is not available. Classic mode in particular should work acceptably when the required version of PHP-CSS-Parser is not available. 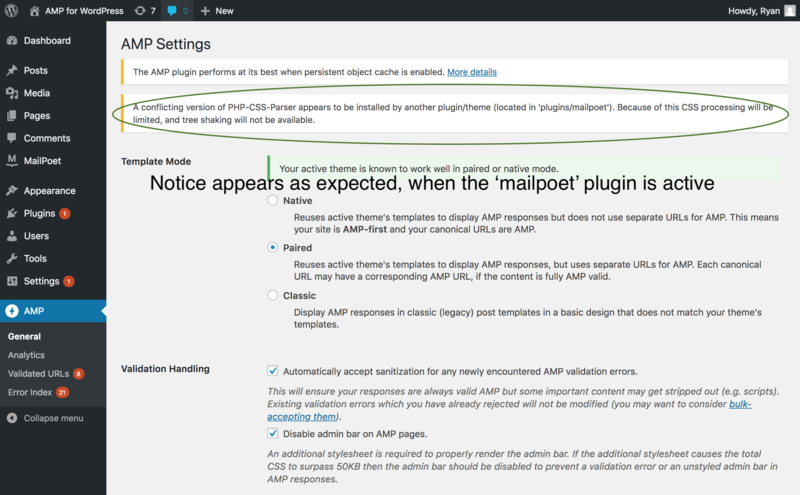 The admin notice appeared when the Mailpoet plugin was active, but it didn't appear otherwise. This looks good when the Mailpoet plugin is active.